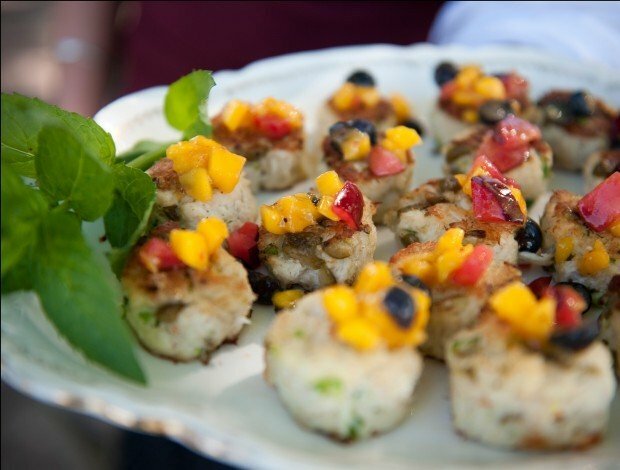 This photo from ‘Yumtwist: The Art of Spontaneity in the Kitchen’ shows Crab Cakes with a mango garnish. This photo from ‘Yumtwist’ shows chef Sarah Knecht. Don’t have what you need in the pantry for a certain recipe? Improvise. Want to take a traditional recipe and modernize it? Get creative. Can’t think of a word to describe what you’re doing? Make something up. “Yumtwist” is a word Knecht coined herself. It’s a word that describes not only her approach to cooking, but to art, events and life in general. Knecht provides a definition on the first page of the book. Want an example? Take chops — lamb or venison or elk. Grill them and add some Artichoke Pesto (recipe below). Here’s a yumtwist: Squeeze some citrus juice — lime, lemon, orange — on the chops before serving them. Another yumtwist Knecht offers is to drizzle either port wine reduction or balsamic reduction on the chops before serving. The book, which is loaded with colorful photos, features more than 200 recipes, but the yumtwists lead to endless possibilities. Knecht grew up in the Paradise Valley and learned a lot about what she knows about cooking from her grandmother. The rest she learned in the kitchens of restaurants, hotels, country clubs and even on private yachts in Alaska. 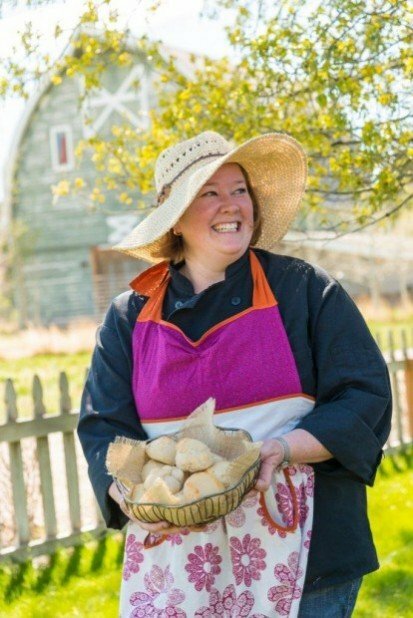 After moving back to Montana, Knecht has used her culinary talents as a private chef, caterer and cooking instructor. Now, she focuses most of her time — when not writing cookbooks, teaching cooking classes and taking care of her two children — planning destination wedding feasts. She had to apply her yumtwist philosophy to a wedding she cooked for this past weekend, a wedding that included guests so famous they must not be named. Knecht had to veer from her original plan and come up with a backup plan at the last minute. Yumtwist is also about being spontaneous and somewhat fearless. Want another example? After talking with the IR, Knecht ran into actor Aaron Eckhart at a store in Bozeman. Instead of asking for his autograph, she handed him a copy of her book. Now that’s a yumtwist. Buy two lamb or venison chops per person or one elk chop per person. Get them “Frenched” or trim the fat off the bones yourself. Salt and fresh ground pepper both sides generously. Lay chops out on sheet pan and spray with nonstick cooking spray. Heat grill to med-high, then mark both sides of chops quickly keeping them rare. Finish in oven at 425 to 450 for 3 to 5 minutes or until desired temperature. Make aioli the day before you plans to serve the Crab Cakes. Make the Crab Cakes the same day you plan to serve them. Making the crab cakes stay together is all about the perfect balance of moist and dry. Test out flavor and consistency. If the cakes are falling apart and too moist — add more bread crumbs. If the cakes are too dry — coming together sticky, they will only dry out more when cooking — add some more aoli or half an egg yolk. Make up the crab cakes into desired size and put in Tupperware, separating layers with parchment or plastic wrap. I form my pointer finger and thumb into a circle and mold them while I pack them tight on both sides with my fingers on the other hand. This step can be done up to eight hours before service. Cooking method 1: Sear one side of each crab cake in a large cast iron pan. Once all cakes are flipped, place pan in oven and bake at 350 for 7 to 10 minutes. Top with a small dollop of aioli or tartar before serving. Cooking method 2: Line cookie sheet with parchment paper and space crab cakes evenly, 1 inch apart. Bake at 400 for 10 to 12 minutes or until edges are just starting to crisp and the cake is heated thoroughly. Chef Sarah Knecht will be signing copies of her new book "Yumtwist: The Art of Spontaneity in the Kitchen" in Helena on Saturday. She will be at Montana Book and Toy Company, 331 S. Last Chance Gulch, from 1 to 3 p.m., and at Panhandler Plus, 40 S. Last Chance Gulch, from 4 to 7 p.m. Knecht will have samples from the recipes in her book available for tasting. The books sells for $30.